We have conducted a survey of high and mid-range restaurants in the immediate vicinity of the LetUsConnect Farm property in Montgomery Township. Of the 14 restaurants surveyed, 13 said they would be very interested in purchasing hydroponically grown produce from LetUsConnect Farm. Based on the average number of leafy greens used per week per restaurant, each client could purchase between 20-25 cases (cases are 4lbs each) for a total of 1,770 pounds per week. A single greenhouse can produce 180 lbs. of leafy greens and 36 lbs. of specialty items such as basil and Pac Choy per week. Priced at $6.25 per pound for leaf greens and $8.00 per pound for specialty greens, the weekly gross should be a little over $1,400 per week or $74,000 per year. Based on a single greenhouse scenario, each greenhouse needs between four and five retail clients to breakeven. The economy of scale is realized when additional greenhouses are added to the program because of increase in revenue in a production versus training greenhouse. The addition of other high-demand produce, such as micro greens, tomatoes, cucumbers, and peppers, can increase revenue. The production greenhouse would utilize trained individuals with disabilities who would be paid, but would not require a training supervisor and the facility manager would be shared among the greenhouses until the number of greenhouse reached four. According to Cornell University’s Controlled Environment Agriculture System, a hydroponic farm measuring between 1,400 – 1,500 sq. ft. is capable of yielding approximately 170 lbs. of lettuce every week when in full harvest. Each unit of lettuce produced, whether in “head” or “leaf” formation, will weigh approximately one-quarter pound. The first harvest takes 32 days from seed to maturity. After this initial growth period, it is estimated that a 1,440 sq. ft. farm will generate approximately 138 pounds per week in its first year of operation, 152 lbs. per week in year two, and 167 units per day in year three. As experience is gained in the production process, our target is to reach optimal production levels at 170 units of lettuce per day by year four. Since crops grown in greenhouses are immune to changes in weather, this makes production levels significantly less volatile when compared to field-grown vegetables. 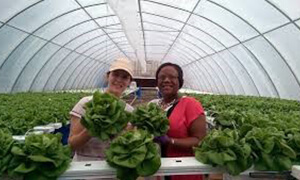 Therefore, LetUsConnect Farm is confident in its ability to attain the aforementioned production levels on a consistent basis for its customers. The mission behind LetUsConnect Farm is not to compete with industry giants and capture a significant portion of the market share in the hydroponics industry. Rather, LetUsConnect Farm will be more focused on competing on a smaller, local scale during its early stages of growth. Any income that the company generates will be re-injected back into the business to fund its organizational goals of community involvement and vocational support for individuals with disabilities. 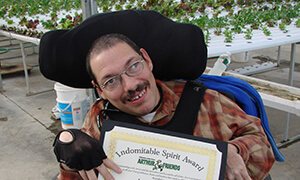 In addition to receiving competitive market prices, consumers who buy produce from us will also receive added value by supporting individuals with disabilities as well as the organization’s mission in providing these individuals with rewarding employment opportunities. In 2006, a study from the University of Massachusetts Boston's Center for Social Development & Education revealed, “Overwhelmingly positive attitudes among consumers toward socially responsible companies, and in particular, toward those that hire individuals with disabilities. Specifically, 92% of consumers surveyed felt more favorable toward companies that hire individuals with disabilities, and 87% said they would prefer to give their business to such organizations” (University of Massachusetts Boston).